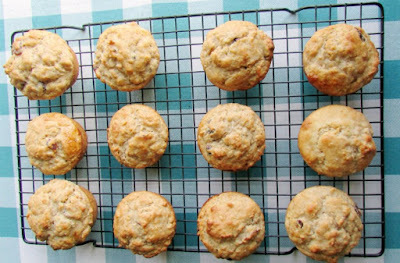 Orange, cranberries come together with just a hint of spice in these oatmeal sourdough muffins. They are a perfect grab and go breakfast or fun healthier brunch treat. 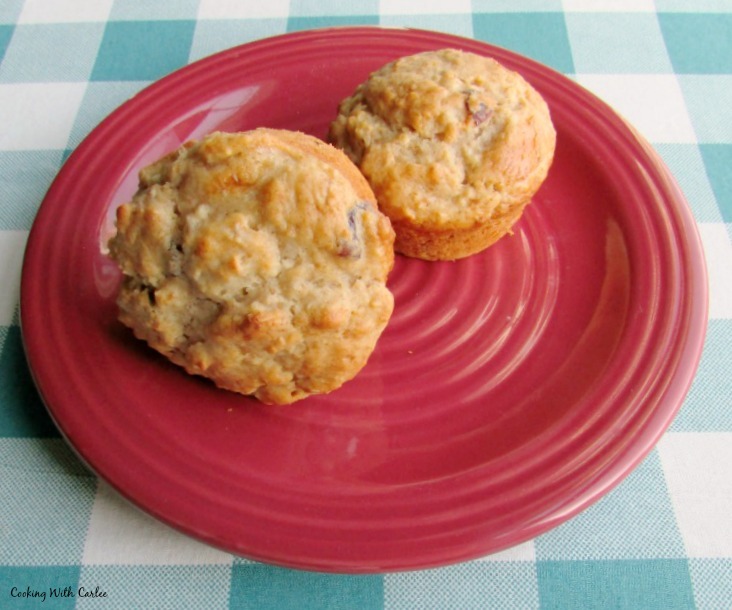 Muffins are a great grab and go breakfast for busy mornings. They are also a quick and easy way to serve guests. So I made a bunch for my sister's bridal shower brunch. We love to have some in the freezer anyway, then we are about 20 seconds away from a breakfast Jax loves. 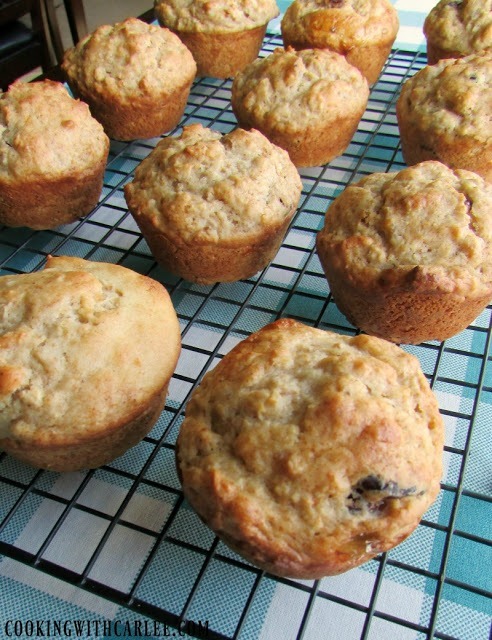 The best part is these muffins are pretty darn healthy, so you don't have to feel bad about it. 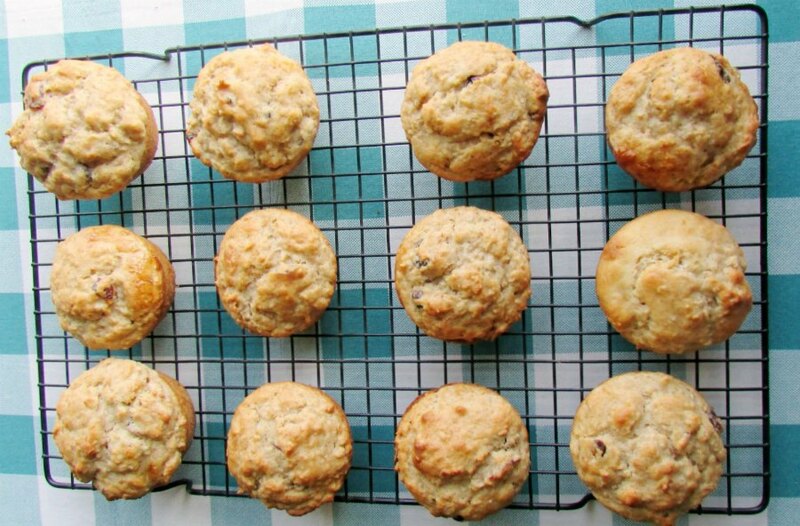 These muffins come together really quickly, so don't let the sourdough part scare you off. It is a great use for some spent sourdough when you go to refresh it. Then there is the oatmeal and yogurt to help make these a well-balanced choice. You even get some fruit in the orange juice and cranberries. Woo-hoo! These would also be a perfect breakfast for Thanksgiving morning. Bake them the day ahead to free up your oven if you eat at lunch or bake them fresh if you eat a little later. Either way your guests will have a little something to eat, but not too much. We don't want to spoil the big meal later! Again, whatever are left can be thrown in a freezer bag for another day. Perfect! Stir together oats, orange juice, yogurt and dried cranberries right away and let sit while you gather up the rest of the ingredients and get ready. You want the oats and cranberries to have a chance to soften up a bit. Preheat the oven to 400 F and grease a 12 cup muffin tin. Stir sourdough starter and brown sugar into oats. In a small bowl, mix together flour, baking powder, baking soda, cinnamon, nutmeg and salt. Stir oil and egg into oat mixture. Then stir in dry ingredients until just mixed. Spoon into prepared muffin tin. Bake 20-25 minutes or until golden brown. Remove from muffin tin and cool on wire rack. Another cranberry winner my love! I love sourdough and of course oatmeal so these look divine! Oh how I wish I could grab one through the screen to have with my coffee this morning! I wish I could deliver! Thanks, Andrea! I love that these have sourdough starter in them - must give them a try! I have been loving making muffins when my starter needs refreshed and the texture turns out so good. I hope you love them, Caroline! These muffins sound amazing! My goal this year was to get into sourdough. Well, I haven't done it yet! I think it's a carry over goal! I've never used my starter for muffins. Now I have to try these! I haven't ever had a sourdough recipe but this sounds delicious! I love playing with my sourdough. I watched a documentary on sourdough and bread once and I got a starter started that night! Gorgeous! I like the idea of the sourdough in this. Bet they we tangy and delish! It does give a nice flavor and a really great texture! Thanks! The most common excuse for this is a busy schedule. Love that there's oatmeal in these muffins! Thank you! The oatmeal kind of melts away in this recipe and it just leaves you with a great texture and plenty of nutrition! Love sourdough, love cranberries, love oats!